Most of the Common Core standards that are addressed by blogging fall into the general Digital Literacy Category of: Demonstrate the ability to use technology for research, critical thinking, decision making, communication, collaboration, creativity and innovation. The predominant standards include Reading Informational Texts, Standards of Mathematical Practice, and, of course, writing. There are also standards that can be found through the Career Tech Ed (CTE) documents that are addressed that have to do with workforce readiness and 21st Century Skills. Some of the soft skills addressed are at the front of every CTE Standards manual and I have included the one in the front of the Arts, Media and Entertainment industry manual since that is my area of teaching. These are the ones that are of most interest when it comes to blogging and fall under the category of Knowledge and Performance Anchor Standards. Click on the images below to access those full documents. 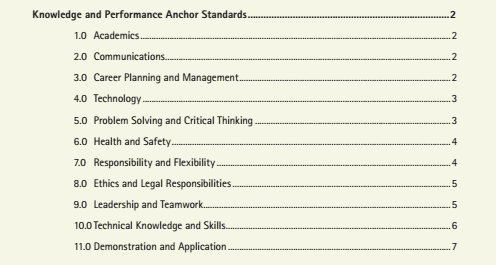 You can find standards that apply from the 11 Elements of a High Quality CTE Program as well.